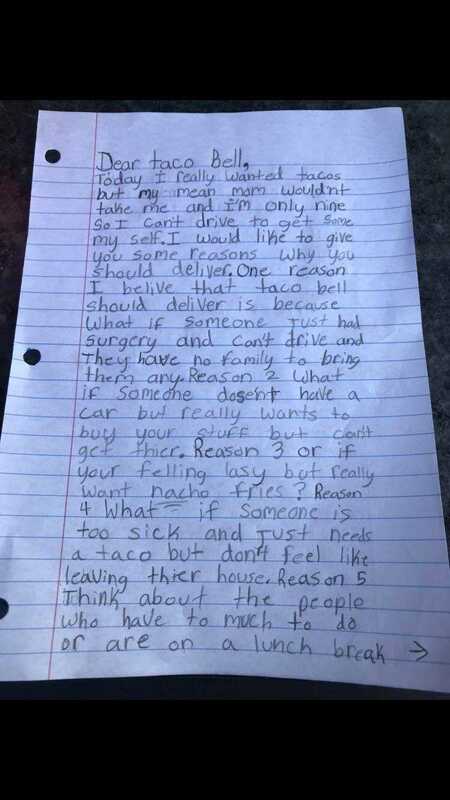 A third grader from Davison, upset with mom for not taking her to Taco Bell, wrote a letter to Taco Bell telling them why they should have a delivery service. I vividly remember the first day, back in elementary school, when I first learned how to write a persuasive essay, because it changed my life. Finally, I had a constructive way to ask my parents for the new Polly Pocket cruise ship while sounding like a mature adult and not the child I was, obviously. According to Cindy Prevo – the mother – her daughter, Kinsley Lynn James, has been writing persuasive essays ever since her teacher taught her class about them. And when Kinsley asked her mother if she could pick up food from Taco Bell for dinner and her mom declined, she sprung into action to use her talent to create change. Now, it turns out Kinsley could be a catalyst for that Taco Bell delivery service. After Kinsley’s mother sent Taco Bell a Facebook message containing her daughter’s letter, the corporate office actually called Kinsley to invite her to their convention in Las Vegas – with 400 franchise owners – where she will read her letter aloud. Granted, Taco Bell does have a very limited delivery service via Grubhub – but, as of this writing, only if you’re lucky enough to live in Omaha, Nebraska, Indiana or part of California. Perhaps, thanks in part to this can-do girl, that is due for a change. 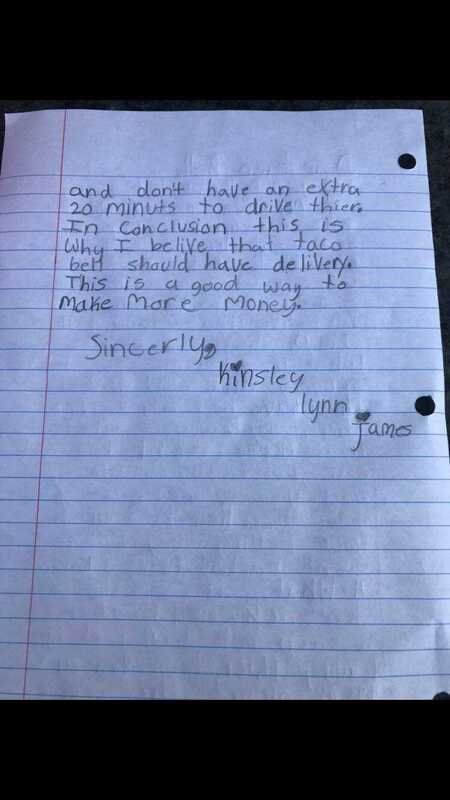 If this initiates widespread Taco Bell delivery service for the masses, I wouldn’t be surprised if Kinsley won a Nobel Peace Prize. How would you feel if your children put their writing skills to use to call you out for not getting Taco Bell for dinner? Comment below!